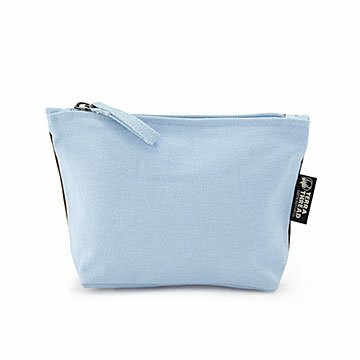 Pretty, sturdy, and handy, this organic cotton bicolored pouch will keep your small essentials organized. We can't decide if this two-color pouch is more pretty or more handsome, so we're going with both. One side is sky blue; the other, earth brown. Simple and sturdy, it's a handy organizer for your daily dash or weekend packing. Quality fabric, hardware (YKK lead-free antique finish metal zippers) and construction mean it will last through a lot of bag trends, and look great with all of them. Made of GOTS (Global Organic Textile Standard) certified natural dyes and cotton grown on family farms. Assembled in a Fair Trade Certified factory in Kolkata, West Bengal, India.